An IUI cycle generally bears minimal-to-moderate risk with the most noteworthy concern being the risk associated with delivering twins, triplets, or more. An IUI procedure involves passing a soft plastic catheter through the cervix (the entrance to the uterus) and into the uterus. The prepared sperm sample is then gently forced out of a syringe, through the catheter tube and into the uterus. This is generally associated with mild cramping, but little-to-no pain. According to the best study in the field, over an 18 year period during which 48,000 inseminations with donor sperm were performed, 47 infections were reported culminating in an infection rate of less than 1 per 10,000 IUI cycles. 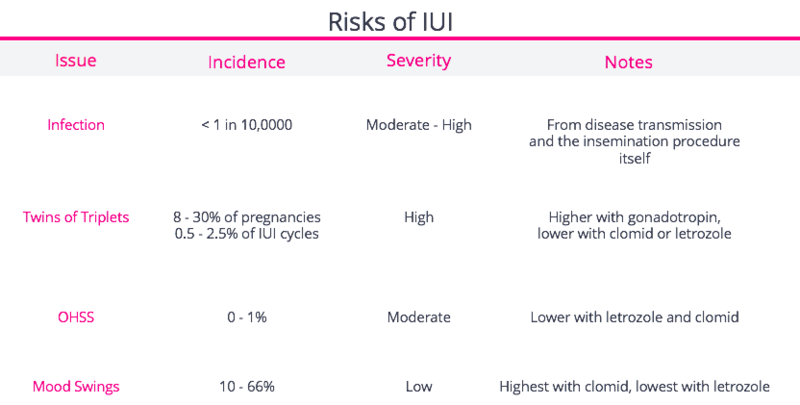 Pregnancies of multiples are the most common and the most severe risk associated with IUI. When IUI is accompanied by clomid or letrozole, 1 - 14% of pregnancies involve multiple gestations. IUI accompanied by gonadotropin records even higher reates. Contrast this to IVF, where the rates can be as low as 1%, or as high as 30%, depending upon how many embryos you and the doctor choose to transfer at any one time. While most twin pregnancies end with a positive outcome, multiples are associated with an increased risk of nearly all obstetric and neonatal complications. OHSS is a syndrome that occurs when the signal to the ovaries to recruit follicles becomes too strong. This results in swelling of the ovaries, abdominal bloating, leakage of fluid into the abdomen, and dehydration. This typically only occurs when high levels of gonadotropins are taken (like in an IVF cycle). However, this can occur in an IUI cycle if enough follicles are recruited, regardless of the medication taken. These side effects occur more often for IUI patients taking clomid or letrozole and less so for women taking gonadotropins. In one study, nearly two-thirds of women reported some change in mood while on clomid. This typically means irritability (a “short fuse”), feeling down, and generalized discomfort due to bloating. Hot flashes are the next most common side effect, occurring in up to a third of women taking clomid and 20% taking letrozole. These symptoms appear to be more common when higher doses (150 mg) of clomid are needed to cause ovulation. Visual disturbances, manifesting as as shimmering sensation, sensitivity to light, and double vision, occur in about 2% of patients taking clomid or letrozole. If you experience these symptoms, you should report them to your doctor. Most of the time, these resolve without any issues. However, there have been extremely rare reports of longer term neurologic issues, so your doctor will probably change you to a different medication if you are experiencing these symptoms.